In 1911, at the third competition for the Gordon Bennett trophy in Eastchurch, England, an American aviator, Charles Weymann, won the cup while flying an extraordinary new monoplane – the Nieuport II. With an overall speed of 78 MPH, but allowing for turns, he must have done around 90 miles an hour on straightaways. This airplane was small, but fast, fast, fast, a style which would serve its successor biplanes well in WWI, starting with the Nieuport 11. In comparison to the lumbering Wright & Curtiss biplanes of the day, the little Nieuport looks quite modern, with its monoplane design, streamlined fuselage, wheeled landing gear, rudder + elevator tail unit, and tractor propeller. [ad#ad-1] In 1911 the brothers Charles and Edouard de Nieuport produced the monoplane more commonly known as the Nieuport, which was noted for the extreme simplicity of its design and the finish exhibited in its structure. It resembled more the 1910 R. E. P. monoplane than any other type, but was much smaller. The fuselage was a very thick body, tapering well to rear. The pilot and passenger sat close together, with only their heads and shoulders visible above the fuselage, essentially a modern cockpit. All unnecessary obstruction was removed to reduce head resistance. 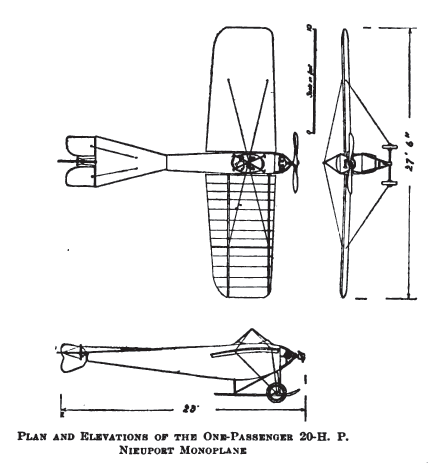 The under-carriage consisted only of three V’s of steel tube, of streamline section, connected to a single longitudinal skid, thus diminishing drag to a noteworthy degree. This made a very fast machine. With only a seven-cylinder, 50 horse-power Gnome engine it travelled 70 miles an hour, and with a fourteen-cylinder, double-row, Gnome, rated at 100 horse-power but actually developing 70 horse-power, it reached between 80 and 90 miles an hour. The faster WWI-era biplanes showed the influence of the flat streamlined, all-inclusive body of the Nieuport. William Stansgate, in his WWI memoirs, “In the Side Shows,” recounted his experiences with a two-seat Nieuport monoplane (most likely a Type IV, or Type VI, similar to a Type II), equipped with floats as a seaplane. The Egypt Seaplane Station was formed with airplanes from the British seaplane carrier Ben-my-Chree, along with a small number of Nieuport monoplane seaplanes under French command already at Port Said. Colonel L’Estrange Malone, who was in command, very soon succeeded in creating from these two elements a new center of seaplane effort. In the year 1916, the Turks had overrun the Sinai Peninsula, and the British front line was not far east of the Suez Canal. The Army was pushing on along the old coast road by which Napoleon reached Syria. For aerial reconnaissance they had machines based on a camp near the Canal. Our work was different from that of the Army aeroplanes. A glance at the map will show that the Turks depended for communication with the north on a railway (from Aleppo to Beersheba) which was mostly open to attack by air from the sea. It seemed to us that we could render valuable assistance by careful reconnaissance over this part of the country. A naval gunner first aims at his target by some sort of calculation based either on a map or perhaps on direct vision. As soon as the ranging shots are fired, real observation commences. The old method was for one officer to watch from the the ship itself the fall of the shots and telephone corrections to the gun. It was thus that hits were secured. A far better way, however, is aerial “spotting.” A Nieuport seaplane, or other spotting aircraft, can fly right over the target and sees precisely the error which the ground officer can only judge by inference. The pilot carries an air photograph on which lines are drawn round the particular target ship at certain distances. By watching where the shell falls on the ground and comparing this with the lines on the photograph the pilot can tell at once the extent in yards of the gunner’s error. This information he reports to the shipâ€™s gun battery by radio. It may be easily imagined that the “spotting ” machine circling over is not popular with those who are being shelled, and the most active steps are taken to interfere with its operations. About April, 1916, however, the Germans sent a number of airplanes to the assistance of the Turks, and as they were still able to use the adjacent desert for a forward airfield, attacks on Port Said were easy. An air raid, however, was no great matter; the real evil was that our seaplanes, when they went inland from the coast to spy out the enemy, were attacked by German L.V.G.s, to fight which, of course, they were entirely unmatched. This was to be my first flight to Jaffa (near modern Tel Aviv) as observer to my new commanding officer. I am afraid I rather overdid the equipment for the occasion, mounting a pistol which afterwards I abandoned for ever on account of its great weight and inconvenience. I was still further encumbered with a camera, several drums of machine-gun ammunition and a special map-board. I went to bed at 8 o’clock the night before, for we were to be called at half-past three in the morning, but though I would have slept, more than once during the night I groped my way out on to the moonlit deck to look at my watch. At 4 a.m., stumbling past the engine-room and improvised bunkers, I reached the hangar, closed in by a big steel shutter and only illuminated by dim electric hand-lamps. On deck not a glimmer. A whistle from the officer in charge and all lights were dowsed ; the shutter with a screech rose and with a low rumble the big machine was shoved out on its little trolley. As the shutter opened the dawn could be seen faintly pink. There was a stiff breeze and a considerable sea, and all the experts united in advising Samson not to attempt the flight. That was not his style, however. He had made his plans and was determined to persevere. Naturally, I was perfectly satisfied, although my advice was not likely to be asked. We were hoisted over in the growing daylight and dropped on the waves, which soon made themselves felt and suggested to me what turned out to be a very useful precaution, namely, that of taking off my boots and putting aside my pistol and map- board. Thus alone could I hold the camera on my knees in the approved way, to keep it from a jar in the roughness of the sea and to keep water from spraying the lens and spoiling the exposures. We now merely had to wait till we had drifted sufficiently astern of the ship to start up the Nieuportâ€™s rotary engine. As soon as we were perhaps half-a-mile or more away the compressed air-bottles were opened and the propeller started. Certainly the seaplane rode the surface splendidly, but when we tried to move, it became clear that we should have trouble. We could get a little rise of a foot or two, but before air-way was gained a wave would give the floats a heavy cuff. This brought us, of course, on to the surface again with a bump. Samson persevered again and again, but finally the waves thumped us so hard that both the light wood floats were burst. Then the natural thing happened. The buoyancy of the floats having gone, the centre of gravity was altered and the heavy engine pulled up the tail of the Nieuport, which proceeded to stand on its head, looking like a huge obelisk emerging from the sea. The big wings, now on the waves, were sufficiently watertight to maintain the whole structure, so that so far from being alarmed we both burst into hearty laughter and climbed out on opposite sides, standing on the wings and attempting to salve our expensive belongings. We were not even wet. In the meantime, the ship, seeing the accident that had happened, worked round to approach us, but just as she was coming up, the planes became waterlogged and to our intense amazement and, I may add, disgust, the whole seaplane suddenly dived, leaving the commanding officer and me floundering in the water. A rope was thrown to Samson, which he wound round his arm and by which he was pulled, nearly with the loss of that member, up on the “rubbing streak,” which formed a sort of little outside pathway round the ship. In the meantime, a good marksman had thrown a buoy which fell right over my head. The ship was then stopped for fear the propeller should draw me down, and a motor-boat was launched, into which I scrambled. The motor-boat was in charge of a midshipman, Nicol, a Guernsey man, and as gallant a lad as ever stepped. His job in this very rough sea was to try to save the seaplane. Very soon the boat had drifted a long way from the Ben-my-Chree. Every time we approached the aircraft, which was completely waterlogged and showing only its tail, there was danger of us either being carried on to it, and getting stove in if we went bow on, or damaging our propeller if we backed on. Finally, I swam with a line, put it round the tail and in triumph we towed the salvage back to the mother ship. Now our work was over. The tackles from the davits were made fast into rings in the motor-boat and we enjoyed the Elijah-sensation of direct ascension, glad indeed to reach a paradise which contained dry clothes and breakfast. As the sea was too rough at Jaffa, we steamed to El Arish, which we bombed and also photographed to learn the result of the naval bombardment.